Socialist Realism: socialist in content, capitalist in price. One would have thought that paintings depicting brawny workers and peasant women and promoting the Soviet ideology should have become a thing of the past, together with the rest of the USSR. However, the opposite is the case: The Soviet Union is no more but its art is very much alive. RBTH tried to find out why socialist realism is one of the most popular and expensive genres on the art market today. Alexander Deynika’s exhibition, ‘To work, build and don’t moan‘ at the State Tretyakov Gallery in Moscow. The year 2014 could be considered the year of socialist realism. Early in the year, Sotheby’s auction house held a non-commercial exhibition in London called Soviet Art. Soviet Sport. It featured some 40 works of socialist realism, most of which were presented by the Moscow-based Institute of Russian Realist Art. In May, an exhibition of work by Soviet artist Viktor Popkov opened at London’s Somerset House (after having been to Moscow and Venice). In the first days after the launch, it was seen by some 3,000 people. The papers described it as one of the top five most interesting events in London at the time. Furthermore, a whole museum of socialist realism is due to open in London before the end of the year. Finally, in June, Sotheby’s put up for auction the socialist realism collection of the International Confederation of Artists’ Unions, the Russian organization that succeeded Soviet artists’ unions. Two dozen works were estimated at a whopping 4.5 million pounds ($7.7 million). Socialist realism is a style of realistic art that was developed in the Soviet Union and implemented in visual arts, literature, music and even architecture. Unlike social realism, which deals with subjects of social concern, socialist realism is aimed at glorifying the people’s struggle for rights and freedom and depicting the building of a new Communist world. Works of socialist realism were usually commissioned by the state, the only employer and patron of the arts in the USSR. “Over the past 10 years, there have been few museum-level socialist realism works on the market,” says Frances Asquith, head of Russian art at Sotheby’s. “Art collectors understand that the value of these works, like the one by Georgy Nissky [which was sold at three times the original estimate], is in their composition, striking palette and artistic juxtapositions rather than in how closely the artists adhered to the principles of socialist realism.” Second wind Socialist realism is enjoying a revival today. 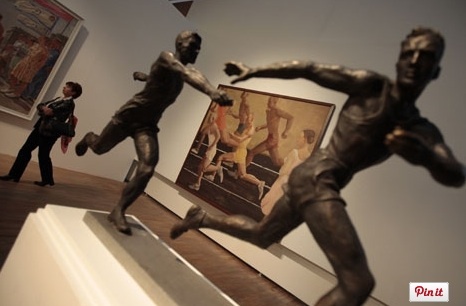 The public are rediscovering the artists who depicted strapping athletes, collective farm workers, rallies, and the everyday life of the Soviet factory. Topics that were easily understood by ordinary people and promoted socialist ideals were the mainstream of Soviet art from the 1930s to the 1980s. Another key characteristic of that artistic method was “a truthful and historically specific depiction of reality”, which for many years banished all the achievements of the Russian avant-garde art into obscurity. Socialist realist artists were not only supported by the state – with government commissions, trips, awards and other benefits – but were also controlled through censorship. In effect, socialist realism was a means of propaganda, a concentrated ideology coated in an accessible artistic form. Over long decades, Soviet people got so fed up with it that after the breakup of the Soviet Union, for whole 15 years it was consigned to the shadows of museum and exhibition life. That was part of the overall psychological fatigue with anything to do with Soviet ideology. However, in the early 2000s, things began to change: A group of collectors emerged who were interested specifically in this style, while auction houses began to include socialist realist works in their auctions on a regular basis. For instance, the Sovkom auction house, Russia’s leader on the socialist realism market, sold over 50,000 lots over the course of 10 years and was the first to fetch record-high prices for leading socialist realist artists: Alexander Deineka, Alexander Samokhvalov, Georgy Nissky, Alexander Bubnov, Arkady Plastov and many others. Exhibitions of socialist realist art have been held in London, New York, Berlin, Frankfurt, and Rome. The large crowds invariably seen at these shows testify to the growing popularity of the art form. A museum of Russian art has opened in Minneapolis, housing the collection of U.S. art dealer Raymond Johnson, who was one of the first to recognize the artistic potential of socialist realism. In the 1990s, Johnson was buying works by Soviet artists for almost nothing, having accumulated one of the largest collections of Russian realistic art outside the former Soviet Union. Socialist realism on the art market All things Soviet came up for sale during the perestroika years: Socialist realism was sold alongside traditional Russian dolls, and foreigners viewed it as something exotic, bordering on tacky. These days, as confirmed by the owner of the Moscow-based auction house Sovkom, Yury Tyukhtin, this fashion among foreigners for things socialist realist is no longer present.